I don't know what the low was last night, but whatever it was, it was definitely prolonged. When I lay down last night, the temperature was 35. It was 28 when I got up this morning. Despite the tarps, two of the remaining four beds--the Super Chile/Nu Mex Big Jim cross and the Habaneros--were lost. Tonight I covered the last two beds, which are the tomatoes and the Frankenchilies. I'm going to do my best to get keep them both alive through Saturday night, and on Sunday, I will strip them and let them go. They both look pretty rough. On Sunday, the last day of my weekend and two days before the pre-winter stretch hits, I will have sufficient free time to strip these pepper plants of everything. I will then perform Gardener Assisted Suicide (GAS) on my beloved peppers. My students have written so many papers on the human version that I know all the arguments by heart. I assure you I have nothing personally to gain from this, financially or emotionally. There is no possibility of a cure for winter in the near future. I am a lapsed Catholic who has committed far worse sins in her life than planticide. I believe this is what the peppers would want, if they could somehow communicate their wishes to me. It is time for a cessation of the pain and suffering. May the plant deities have mercy on my soul. Hey mydakota, good to see ya' posting again. Stella, maybe you should say a few Hail Marjorams or Rosemary's. Are you helping them all to the Big Garden in the Sky, or will you be dragging a few of them into your lab and performing Frankenstein's extreme winter torture on them by rending their branches and roots from limb to limb and stuffing them into too small "caskets"? applestar wrote: Stella, maybe you should say a few Hail Marjorams or Rosemary's. Are you helping them all to the Big Garden in the Sky, or will you be dragging a few of them into your lab and performing Frankenstein's extreme winter torture on them by rending their branches and roots from limb to limb and stuffing them into too small "caskets"? You made me guffaw with this one, Applestar. Only a lapsed Catholic can truly appreciate how funny that was! One stone at a time, I am paving my way straight to hell. I'm doing it the natural way. It is supposed to freeze tonight. Though I have removed most of the garden there is still a bit of stuff out there. If it makes it through tonigh it was meant to be. If not the quick harvest and compost is a comin'. Survival of the fittest. I could use a break anyway's. Not to mention I'm growing a few dwarf tomatoes in the house this winter along with peppers and whatever else I can shove in a pot. It's never over! I'm not doing much this winter, but was inspired by the "over wintering peppers" thread a while back. So I thought I'd give it a whirl. Here's my best producing cherry pepper that I cut back and brought inside about a month ago. we wont see frost until late nov or early december. tomatoes will be pulled before then for other crops. Stella Blue wrote: It's never over! I'm not doing much this winter, but was inspired by the "over wintering peppers" thread a while back. So I thought I'd give it a whirl. Here's my best producing cherry pepper that I cut back and brought inside about a month ago. In my heart, I want to keep gardening. 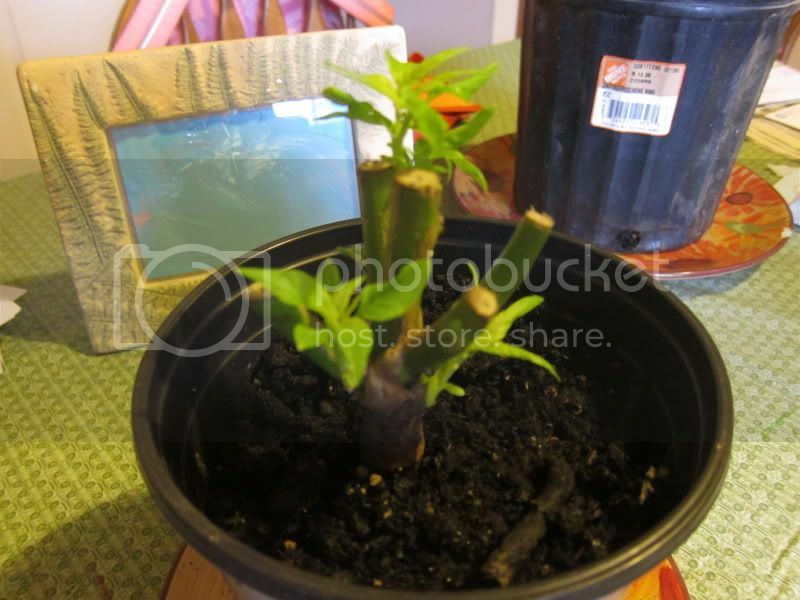 I don't want to propagate cuttings or bring plants in for the winter; I'm not very good at that and can still remember how low I was when Frankenchile the First was wiped out by a violent fungus gnat onslaught. I want to play with seeds, though. In 2010, I got a late start on these favorite peppers, little knowing how much joy they would bring to my life. Because of this, when it came time to save seeds, I had no mature peppers and had to hope that the 8 biggest peppers would have viable seeds. This spring I planted 4 seeds from each of the 8 peppers. My germination rate was pretty low, ranging from 0% on 4 of the peppers to 75% on the oldest one. I want to experiment with seeds from the 4 peppers that didn't germinate. However, I'm worried. This is Wyoming. My house is cold and drafty in the winter. If I play with these seeds and am fortunate enough to achieve germination, will I be able to keep the pepper plant alive for the next five months? Also, I have fluourescent lights (plant lights). Will that be enough to keep them from getting too leggy? If I put them in a window, they will probably get too cold. I want to experiment, but I get attached to my plants, irrationally so, and it will hurt to lose them! Yes, the fluorescent lights will be enough to keep it going through the winter, if you can hang them close to the plants (just a few inches above) on chains so that it can be raised as the plants grow. Leave them on 16 hrs a day. They may not flower and fruit with this light, but the plant should live. Cold and drafty is more problematic. Would probably help if you could find a way to protect them a bit and/or have them on some kind of heat mat. Its always sad when those first frosts lay your garden low, but it is going to come. I was out of town when it happened this year. Now I still have to pick up the pieces and put the garden to bed for the winter. Even though It has frozen the tender crops, the garden keeps giving. Potatoes, carrots, onions, plums, apples, strawberries, and raspberries. Better come over and get some apples. Next week will be our last week of getting farm fresh produce from the CSA farm... I always miss that when it goes away. Just out of curiosity stella, why did you cut the pepper down to the bottom like that? I have a pepper and a basil plant that I brought in. I cut the tops off them, so the plant wouldn't have so much leaves to support through the transition, but they are both still more than 2 feet tall and bushy. It's been about a week that they've been in. I've been misting them daily, but not doing anything else. The basil has new little leaves popping out all over. The pepper not so much and a bit droopy looking, but when I looked closely I found a couple pair of tiny new leaves. Anybody think I should cut them back more now, vs waiting to see what happens? This is my first time to try to over winter either of these plants. There was a light frost on the ground this morning. They weren't calling for an advisory last night. I checked everything out this morning and the peppers are still firm, the basil hasn't wilted, and the beans aren't floppy, so I think that the garden made it through! I'll probably pick everything soon, though. Since one or two more weeks probably won't make much difference anyway. Rainbow, I think I went into detail in last year's winter pepper torture thread, but what I did initially was trim lightly, keeping a good many green peppers, and stick the rootball in plastic grocery bags instead of pots. They stayed in the unheated garage under a shop light while I continued to harvest peppers until the garage temp went down to near below freezing and the plants started to shed some leaves. I made the decision at that point that I wasn't confident that the garage temp will be sufficient to let them overwinter in a dormant state. I then pruned them to mostly sticks. The recommendation in a bonsai website was to prune them to nothing more than a Y. ...and I potted them up in smallest pot I can manage without drastically cutting down the rootball. You can see the growth progression I posted in that thread. They grew a lot by spring. I'll post a link later if I can.... Or maybe you'll find it first.